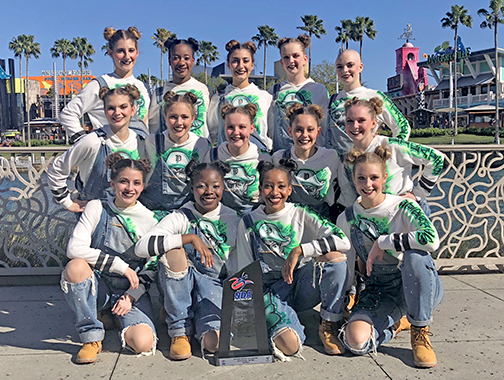 The Pattonville High School varsity drill team placed third in the small hip hop division and 12th in the medium pom division at the National Dance Association (NDA) national championship in Orlando, Florida. Team members are Erin Bailey, Brittany Bell, Allison Brown, Isabel DiSalvo, Amaris Kirksey, Bianca Lee, Renee Neal, Summer Parker, Emily Reyes, Hannah Schamber, Maria Serra, Hailey Sparacio, Lacey Swanson and Chrystian Taylor-Vaughn. Their coaches are head coach Grace Burgos and assistant coach Katie Funderburk.